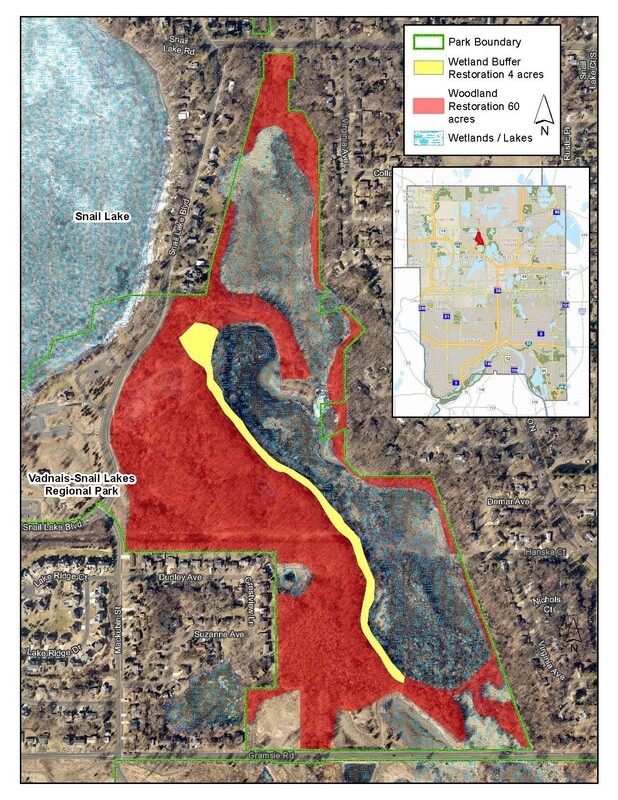 Nestled between Snail and Grass Lakes lies a large parcel of Ramsey County parkland supporting wetlands and remnant oak forest that have been spared significant human disturbance. Additionally, it has unique topography with an impressive diversity of micro-habitats and plant species. Popular walking trails encourage residents to enjoy the area, and it is the largest undeveloped parcel in the northern part of our watershed. Unfortunately, the area has become degraded by invasive plants over the last few decades, and in recent years has been threatened by flooding. In November, the District and Ramsey County were awarded a DNR Conservation Partners Legacy Grant of $252,000, to restore this land. It is an extremely competitive grant program, so we are quite fortunate that this project was selected. The ecological restoration will involve erosion control, invasive species removal, and the reintroduction of native plant species to improve the health, integrity and sustainability of the parkland. 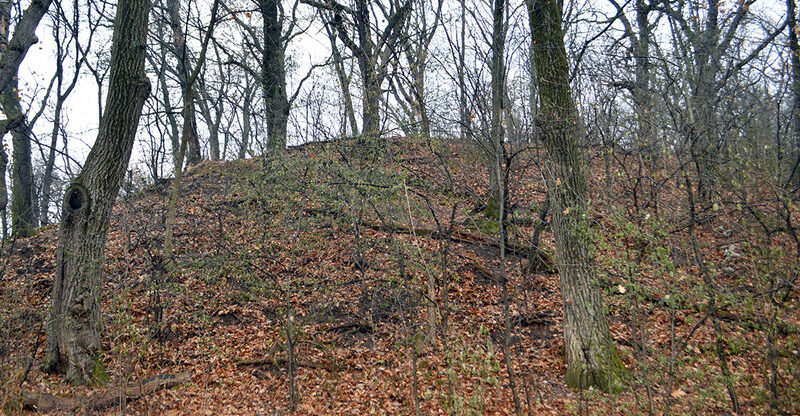 Mature oak forest habitat has been degraded by invasive buckthorn. Photo by Sage Passi. Site preparation work will begin this year, and revegetation efforts – seeding and planting – will begin in 2019 and conclude in 2021. The District and the county is committed to monitoring and maintenance over the long term. We will focus our efforts on 60 acres of degraded forest and 4,000 linear feet of wetland edge, totaling 4 acres of wetland buffer. District staff will lead the buffer restoration work, while county staff will head the upland forest restoration. This type of partnership with Ramsey County has worked well in the past, where we have maximized technical know-how and project funding. 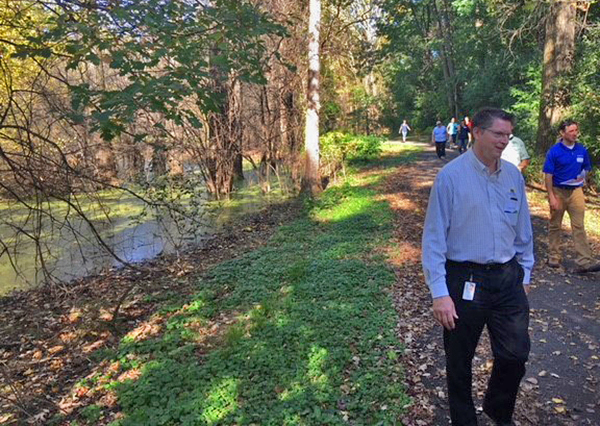 Shoreview Public Works Director Mark Maloney toured the site in September. Photo by Kathryn Keefer. The wetland buffer restoration will address areas that were inundated by the high water conditions and overrun with invasive plants like reed canary grass and buckthorn. Eliminating erosion and increasing native plant diversity will have substantial ecological benefits to the entire wetland complex. Before any revegetation takes place, findings from our ongoing hydrological study of the area will be used to develop a restoration plan for the wetland buffer. Being adjacent to a popular walking path, park users will be able to view the restoration as it matures over time. We hope this will demonstrate a viable land management option to residents who are contemplating their own wetland or lakeshore restoration projects. We look forward to bringing in additional community partners, including more than 300 students from five local schools. Master Gardeners and Master Water Stewards will assist the students with native planting. The Ramsey County Correctional Facility will grow the plants to be used in this restoration and also supply inmate work crews to conduct site preparation. We will also enlist local volunteer groups to collect native seed from nearby restoration sites to use on the project. We expect these partnerships to provide excellent educational opportunities, community ownership and substantial cost savings. Most importantly, the project will bring much needed stewardship to this important ecosystem. The project will restore 60 acres of woodland (shown in red) and 4 acres of wetland buffer (in yellow).